Our AGM was held on Wednesday 6th February when Nigel Priestley (Vice Chair) and Martin Anderson [Treasurer] gave their annual reports. Around 70 people attended the meeting, in itself proof of the success that the Society is currently enjoying. Anita Maunsell gave initial results form our Membership Survey. Every member had received a survey form to complete and the response so far had been only about 25% of the membership. Members were encouraged to return more forms and then the results will be made available on the website. Jeremy Lodge then gave a most interesting and amusing illustrated talk about old and now lost Collingham traditions, much of which was inspired by letters written by two Collingham residents some 60 years ago. Throughout his presentation and in particular at its conclusion Jeremy emphasised the great importance for everyone to talk to people in our community and to write down the stories they can tell us of today and the past. Such everyday stories will be our history which will intrigue future generations. The evening showed yet again that an AGM can be most enjoyable and entertaining, with many members staying behind to chat over tea and biscuits! 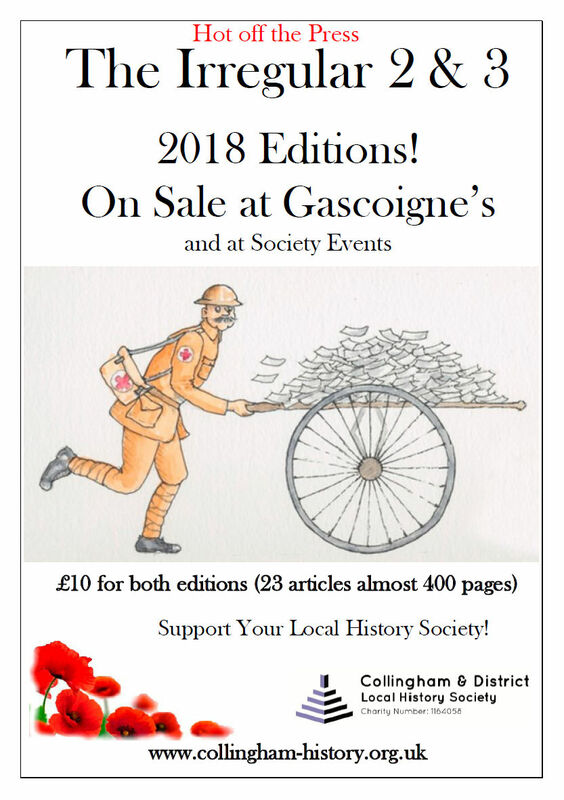 The Collingham and District Local History Society was formed in 1977 as the Collingham Museums Committee since when it has grown and developed to form today’s Society which is registered with the Charity Commission (No. 1164058). We have recently refurbished and redeveloped our Archives, initiated an Archaeology branch and will publish our first Journal in 2017. As well as encouraging and supporting amateur local and family historians, we welcome the curious and those who just wish to browse. We are engaged in various projects across the District and work with many individuals and organisations such as the local U3A and the Nottinghamshire Local History Association. Membership has its benefits but you do not have to be a member to join in. So use the links on this and other pages to see what we can offer you. Our talks and events which are often given by Regional or National professional speakers and historians. Visiting our Archives (The Jubilee Room, 11 Swinderby Road, Collingham, Newark, NG23 7PH – see side panel for opening times) to undertake your own private research which you can perhaps publish in our Journal. Our current projects and how you can get involved. Our Information Exchange and Current Research pages – through which you can contact people with similar interests and post requests or offers of help or information. How you can help us – joining in with one of our current projects, donations of items to our archives, financial donations or sponsorship (please contact our Treasurer, Chair or the Lead of any particular project that you wish to support), nominating us as your Lincolnshire Co-op Community Champion. Please contact the Senior Archivist if you wish to see our Archives outside the formal opening times.